Children ask many questions about God and spiritual issues. These four books from Carolyn Nystrom's popular series tackle some of the most difficult and important questions about our faith. Abridged and repackaged, these mini books make answering these questions easier for adults and more fun for little ones. With colorful illustrations and simple language, these books help children ages 2-5 develop their understanding of Christianity. About "What Happens When We Die? 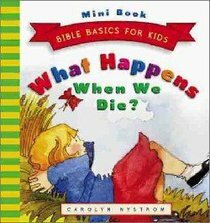 (Mini Edition) (Bible Basics For Kids Series)"
Nystrom is a freelance writer based in the western Chicago suburbs. She has written more than 75 books and Bible study guides and served as general editor for the Christian Classics Series. She lives in Saint Charles, Illinois.